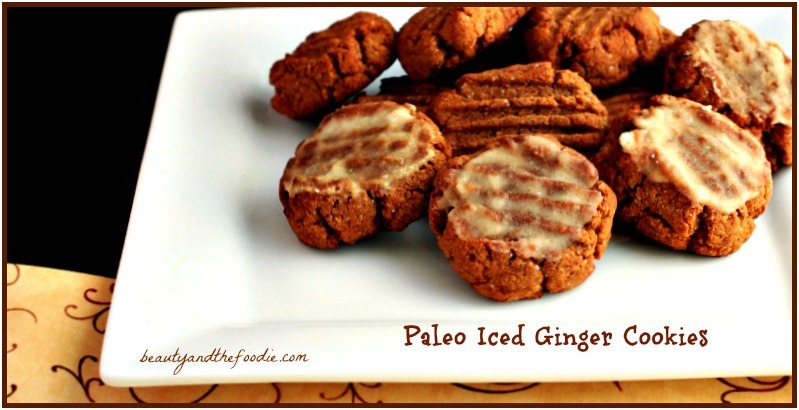 Paleo Iced Gingerbread cookies are definitely worth putting on your holiday baking list. I am not a gingerbread fan, but these are a favorite of mine. They taste like ginger snaps but softer. These were great with or without the icing too. 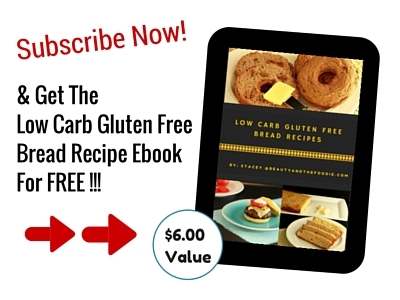 These are paleo with a dairy free and a lower carb version. These are versatile too. You could make them the easy way by flattening with a fork, or the fancy way by rolling out the dough and using cookie cutters. I did a few the fancy way, and all the rest the easy way. I prefer the easy way unless I’m entertaining. I did not have traditional gingerbread man cookie cutters. And strangely enough, I did have a turkey cookie cutter and a leaf one. Probably because I know you are dying to see a gingerbread turkey cookie. Only one made it to the photo though, as my husband must prefer a turkey shaped cookie! Bonus, your house will smell amazing while these are baking!! 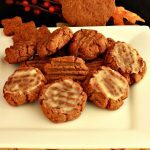 A grain free, iced gingerbread cookie that has a paleo and lower carb version, with dairy free options. cup Sweetener of choice: ½ organic coconut sugar for paleo or ½ cup erythritol for low carb option. 1/8 tsp cardamom * optional can omit. 1/3 cup butter melted, or coconut oil, melted, where to buy. 2 1/2 tsp honey for paleo or for low carb use 11 drops liquid stevia. Preheat oven to 350 F, and line two baking sheets with parchment paper or grease baking sheets. In a large mixing bowl combine: ½ cup coconut flour, ¼ cup almond flour, ½ cup sweetener of choice, 1tsp baking soda, ¾ tsp ground ginger, ½ tsp cinnamon, 1/8 tsp ground cloves, 1/8 tsp optional cardamom, and 1/8 tsp sea salt. Mix together thoroughly. Add to flour mixture in bowl: 2 eggs, 1/3 cup melted butter or coconut oil, and 2 tbsp molasses. Combine thoroughly. The easy way: Form cookie dough into 24 balls, and place on baking sheets. Use a fork to press each ball down a little flatter. The more elaborate way: If you are feeling spunky or have a special occasion, you could put dough between two pieces parchment paper and use a rolling pin to roll out dough and use cookie cutters. use cutters, then peel off top paper. Don't remove cookies from bottom paper, just peel or scrape away excess dough around cookies, and place parchment paper with cookie shapes onto baking sheet (can freeze dough for 10 to 15 mins before rolling if dough is sticky, I didn't but it was cold when I made them). Bake in oven for 10 minutes or until bottoms of cookies are browned. Let cookies cool completely before moving or handling, as they are very fragile until they are cooled off. Now you could make the optional icing if you desire, or serve without icing. They are great either way! In a small sauce pan over medium low heat, warm all icing ingredients until melted. If too thick add more milk of choice. It should be a thick glaze but not a paste (like a glaze texture). Once cookies are cooled, spread a little icing on each cookie. Let icing cool on cookie until icing dries. Could place cookies in fridge to speed up the drying process. Icing will go from liquid to somewhat solid. Store uneaten cookies in container in fridge. Does the recipe call for 1/2 c. sugar substitute? Measurement missing but states 1/2 organic coconut sugar for Paleo or ½ cup Erythritol for low carb option. Yes, 1/2 cup erythritol sweetener is correct. 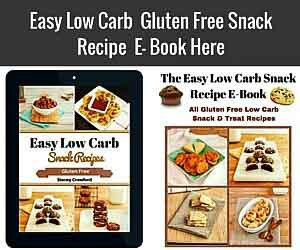 Stacey, made these for my husband who can’t have gluten and I am low carb they were wonderful! Will be making these often. Thank you for an awesome recipe. These were seriously amazing!!! Love, love, love!!! Jennifer, thank you for your kind words. It Really makes my day!! Michael, I wish there was a set conversion for that, but as these flours have very different properties, I don’t know that any substitution would work and give a similar result. thank you for commenting though. 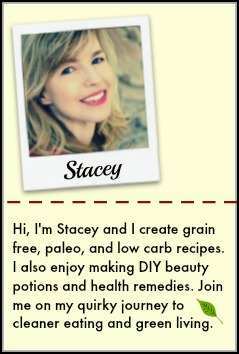 I will keep on the lookout for a recipe that is coconut free for you. Hi. 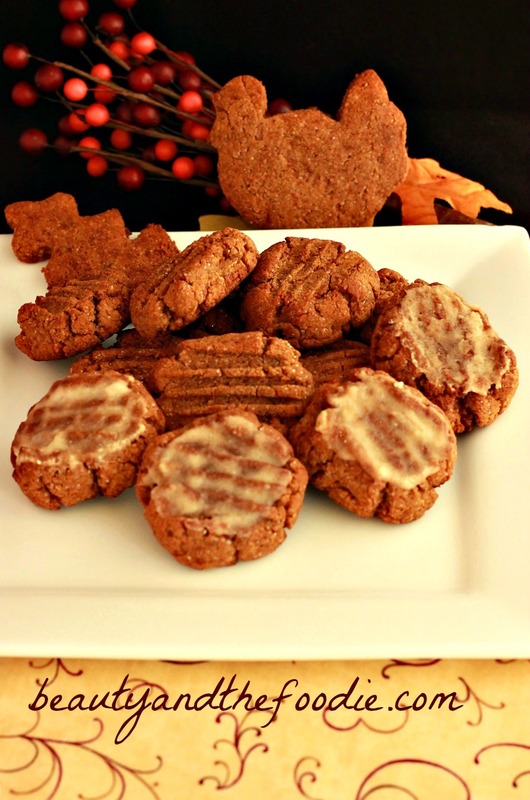 Am looking for a grain free/nut free gingerbread cutout cookie. Could these be done without the almond flour (all coconut flour)? Or would that change the texture too much? Colleen, it might be too soft and sticky without it, although maybe you could replace the almond flour with possibly a seed meal. 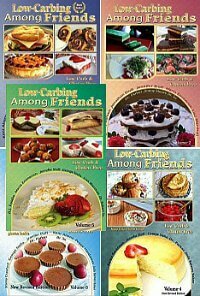 I do seem to have digestive issues with almond flour, but my kids don’t, so I still use it in some recipes. Are you nut free or just not using almonds? Did anyone try without the almond flour/e? Tree nut allergies prevent me fo using it. Otherwise sounds delicious! I have the same question that Colleen had. I am nut free. Any suggestions as to what a substitute may be ? Kathleen (see comment below) also has the same question. AD, You can use ground sunflower seed meal in place of almond flour. I just grind up the raw shelled seeds in a blender until a powder flour-like texture forms. Sometimes the chlorophyll in the seeds turn the cookies a slight greenish color the next day, but it is harmless & still eatable.